Joining Sassafras Quartet for this special occasion, is talented Irish violinist Charlie McCarthy. 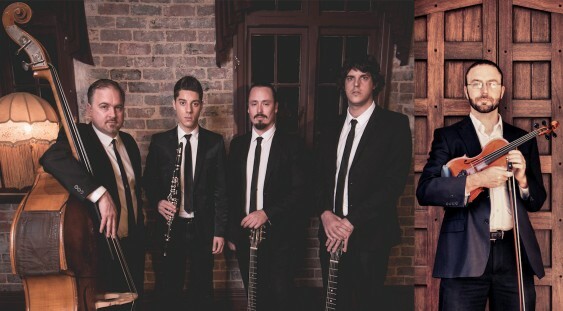 A former resident of Perth, Charlie formed the gypsy jazz group “Belleville” (with guitarist Lachlan Gear) which performed at numerous venues in and around Perth over a number of years. Bassist Pete Jeavons joined the group later too, so this concert will be a fitting musical reunion for Charlie, Lachlan and Pete. In addition to Belleville, Charlie also played with many other Perth groups including The Seals, The Nullarbor Mountain Boys, Sparrow and The Black Velvet Band to name a few. His many years of experience as a musician and wide range of musical interests sees Charlie equally at home in everything from classical and chamber music to country, bluegrass, folk, rock, Irish traditional music and of course, gypsy jazz. Currently residing in Hobart, Charlie maintains a busy schedule as a freelance musician, performing with Tasmanian groups ‘Django’s Tiger’, ‘Jane Morris Trio’ and ‘Harry Edwards Quartet’ among others. Repertoire for this special concert will consist of instrumental music from the the partnership of legendary guitarist Django Reinhardt and virtuoso violinist Stephane Grappelli who were two of the most influential musicians of the 20th Century. The musical style of their group “Hot Club of France” defined a genre and was the soundtrack of Europe’s emerging string jazz scene for decades. You can expect “Hot Club of France” favourites, with a chronological focus on repertoire from 1934 – 1940 including classics such as ‘Minor Swing’, ‘Dinah’, ‘Nuages’ and many more. The concert will be interspersed with short stories and legends of Django’s adventures which will make for a fun night of swinging, hot gypsy jazz. Table General Admin $27.00 Out of stock! Table Jazz Standard/Student $22.00 Out of stock! Table Restricted View $27.00 Out of stock!